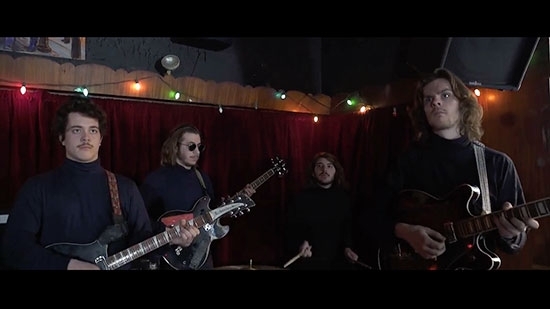 Philadelphia's The Districts have released a new video for the first single 'Ordinary Day' off their just announced new album Popular Manipulations due August 11th on Fat Possum Records. 'Ordinary Day' was released back in February and was available as a 7-inch over the weekend on Record Store Day. They'll be playing an Album Release Show at Union Transfer in August the day the album comes out. All but four of the songs were produced with Keith Abrams of Pine Barons. The other songs were recorded with producer John Congleton who worked with them on the last album A Flourish and a Spoil. The video for 'Ordinary Day' was shot back in February upstairs at Fergie's Pub in Center City and directed by Out of Town Films. It features an audience wearing white expressionless masks and drinking milk while the band plays emotionless. The antiheroine seems to wander as if searching for her place. I can vouch firsthand that the video is a little creepy and weird, I am one of those 'audience members' who wore a mask for hours while it was filmed. Lead singer Rob Grote said that it is supposed to be about loneliness, isolation, and just going through the motions. The song itself shows a stylistic progression and intentional shift in their songwriting that is moving in a very positive direction.